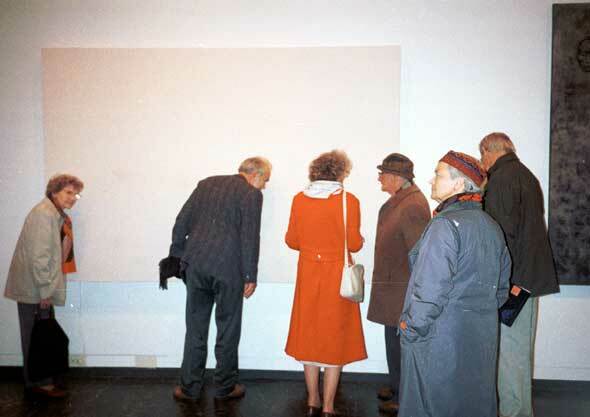 "Homage 'Number 1A, 1948, Jackson Pollock, 'Action Sounding, 1993'" was made for "The Homage Exhibition" at Trondheim's Art Association, 1993. It is a full scale reproduction of Jackson Pollock's painting Number 1A 1948 (173 x 266 cm) but without paint. Instead, 42 small loudspeakers behind the canvas, were used to create an illusion of the sound of paint moving over the surface of the canvas. Anna Karin studied "Number 1A, 1948" and selected 14 main patterns covering the painting. She recorded a reconstruction with herself as an action painter, pouring, throwing paint in the same way as Pollock on a large canvas. A custom made software and p.c. board were developed. The software modulated the recorded mono sound and produced a 3 channel sound. Anna Karin draw the sound with the mouse on the computer monitor and the software calculated the necessary amplitude and phase variations to simulate the movement of the sound over the surface of the canvas. The sound files were burned into eproms and installed on 14 custom designed p.c. boards. 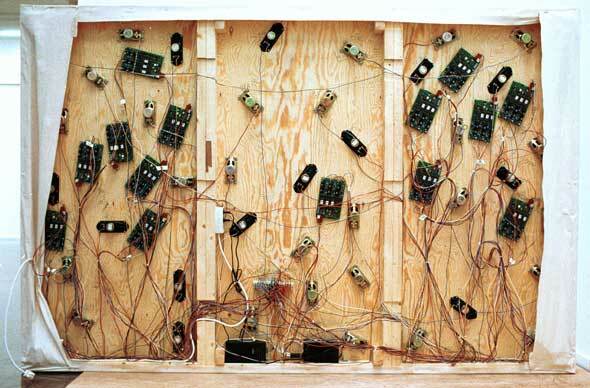 The boards were triggered at random, independently of each other and created an unique sound image each discrete moment. The sound painting is a homage to Jackson Pollock's first real "action painting" and the characteristic technique of Jackson Pollock where painting becomes an act and the painter turns to an actor. "Homage Jackson Pollock" participated in the Autumn exhibition at the House of Artists in Oslo, Norway, 1993 with great success. The piece is owned by The Art Association in Trondheim. It was also exhibited at Screens 1997.